Wall Graphics | ProMark Window Film & Blinds Inc.
Marketing your business doesn’t need to stop at the door. Continue to promote your brand inside. Wall Graphics can cost-effectively transform a bare wall into a floor-to-ceiling full-colour showcase, highlighting your company’s brand. Custom-cut vinyl and full-colour printing produce vibrant and highly durable vinyl and commercial wallpaper graphics in numerous finishes and textures. 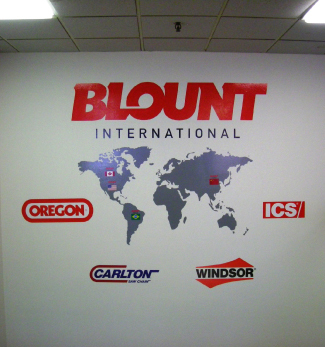 Wall Graphics can be applied to textured surfaces such as concrete, block, brick, tile, poured concrete, and even stucco. Branding can now be featured on what was once an unusable surface display space. Wall Graphics can open up and enhance the look and feel of an area, creating a more welcoming space. Let ProMark Window Film & Blinds work with your business to identify opportunities to continue to visually promote your brand.